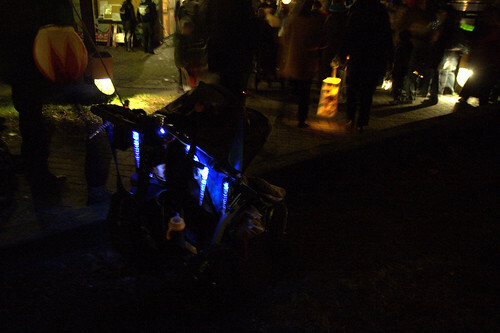 For Winter Solstice there was all sorts of fun organised in Vancouver. 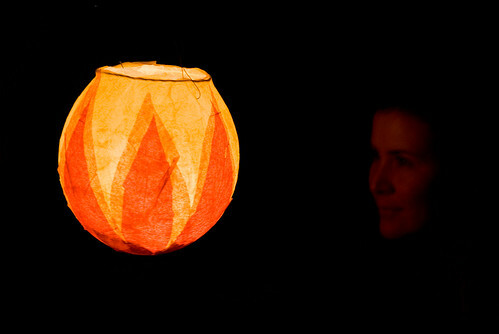 First, Janette went to a workshop at the community center to make a lantern. Lantern making, originally uploaded by GrahamKing. 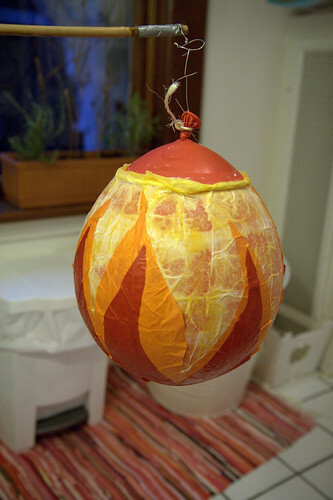 It’s papier-mache glued around a balloon. Once the glue sets you pop the balloon and peel it out from the inside. Put a tea-light on some aluminium foil, attach the whole thing to a bamboo pole, and hey presto a lantern. We took the finished product to a lantern procession. Several processions started all over Vancouver, and three of them, including ours, converged on Granville Island. My lantern for the solstice celebration, originally uploaded by Janetterie. 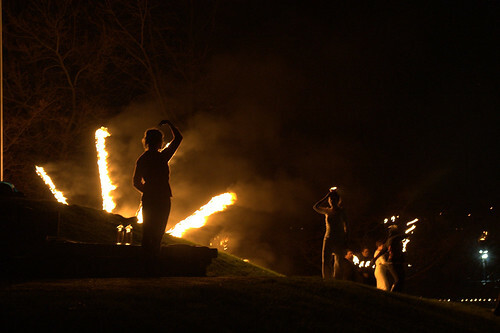 On a hill, on the island, torch bearers told tales and sang songs. 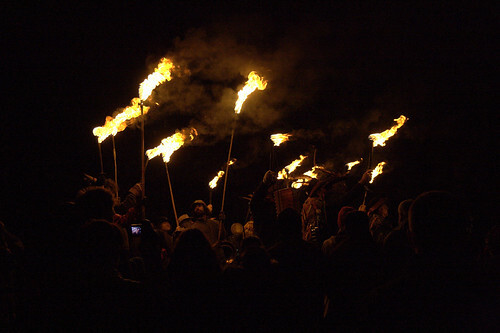 Winter Solstice torches, originally uploaded by GrahamKing. We decorated Julian’s stroller with battery powered icicles. We received many compliments. Possibly people genuinely liked the lights. Possibly they thought we were homeless, and were trying to be nice. Decorated stroller, originally uploaded by GrahamKing. Then, incongruously, a marching band led us all to the other side of the island, where a fire dance was starting. Shadow fire shapes, originally uploaded by GrahamKing. 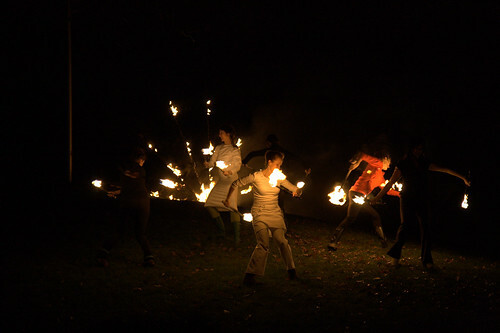 The company performing is called M. Pyre Fire. Dancing with fire, originally uploaded by GrahamKing. 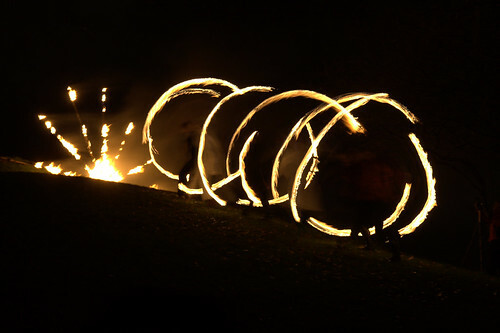 Fire loops, originally uploaded by GrahamKing. After that, all sorts went on. Cookies, hot chocolate, line dancing, and even Morris Dancing, which Julian loved. He clapped to the music and bobbed his head. 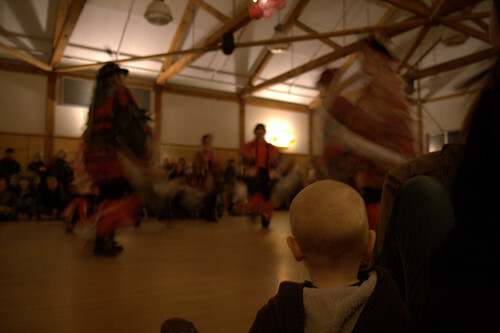 Watching the Morris Dancers, originally uploaded by GrahamKing. 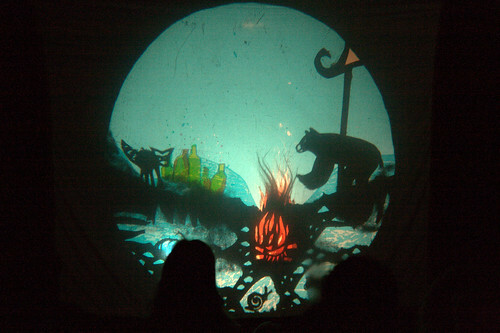 Finally, it was getting late, and we crowded into a small room to watch a shadow puppet show, about a bear emerging from hibernation. 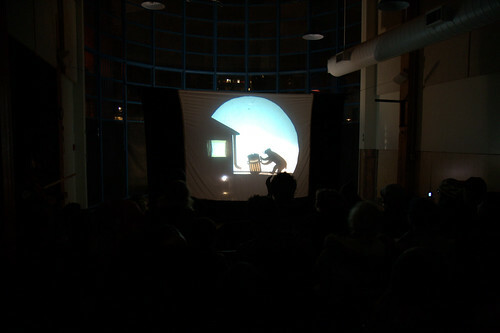 Audience at the shadow puppet show, originally uploaded by GrahamKing. Behind the scenes are two people, a slide projector, and lots of transparencies and cut-outs. With such simple equipment, they put on a wonderful show. Shadow puppets, originally uploaded by GrahamKing. As we walked home, we stopped to talk to a women heading to the celebration. She told us that a new condo development had put some trees out with a ‘Free’ sign. We weren’t going to get a tree this year (we have an outdoor one), but we felt like it found us. 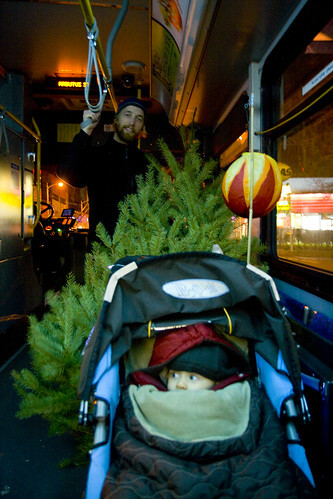 So the three of us, a stroller decorated with icicle-effect lights, a papier-mache lantern, and a 7ft pine tree, attempt to get the bus. The first two buses to go past politely declined to let us board. The third bus had a young driver, he was amused, and kindly let us on. Thanks! Christmas Tree on the bus, originally uploaded by Janetterie. However the ancients celebrated the longest night of the year, we like to think that they would not have been disappointed by our attempt.